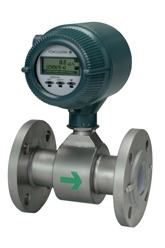 The AXF magnetic flow meter is a sophisticated product with outstanding reliability and ease of operation, developed on the basis of decades of field experience. ADMAG CA magnetic flow meter is excellent at measurement in ultra-low conductivity fluids down to 0.01 microS/cm, adhesive fluids, or slurry fluids. Magnetic flow meters are ideal for conductive fluids in chemical, slurry, and mining applications, with minimal pressure loss. Available in four- and two-wires.